Following the first successful solo exhibition by Albert Namatjira (1902- 1959), which was a sell-out in Melbourne in 1938, the Hermannsburg watercolour tradition has emerged as an iconic Australian school of painting. 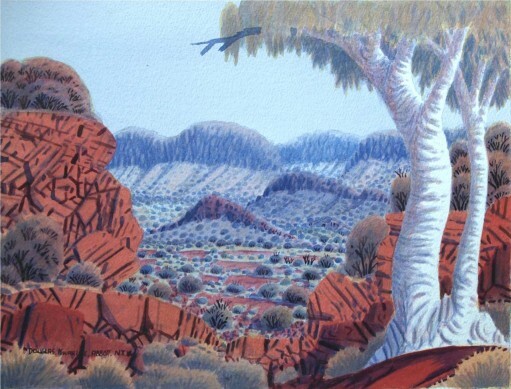 Albert Namatjira’s paintings expressed his relationship with Arrernte country, the West MacDonnell Ranges, and alerted all Australians to the unusual beauty of this landscape. Now, 75 years later, three generations of watercolour artists have emerged from the original Hermannsburg group, and the tradition remains vibrant and strong. Artists currently working in the tradition include Kevin Namatjira, Elton Wirri, Douglas Kwarlpe, Peter Tjutjatjata, Ivy Pareroultja, Lenie Namatjira and Hilary Wirri. Japingka Gallery last exhibited the Hermannsburg artists in 2012, Namatjira Legacy, when the popularity of their paintings proved the resilience of the style and the subject matter first set down by Albert Namatjira. This exhibition is presented in association with Ngurratjuta Iltja Ntjarra. Elea was born the first son of Namatjira and Ljukutja of the Arrernte Tribe at the Hermannsburg mission on the 28th of July 1902. Three years later on Christmas Eve 1905 he was baptized and given the name, Albert. In the same ceremony his parents were given the names, Jonathon and Emilie. It was not customary for Western Arrernte people to have a second name. For this reason Albert’s first paintings were simply signed Albert. It was not until he started exhibiting that it was thought necessary for him to have a second name, when he took his father’s original name and signed his works Albert Namatjira. Albert’s early years were spent on the mission where he became proficient in the trades of carpentry and blacksmithing. At the age of eighteen he eloped with his wife Ilkalita, and they were together forced to live in neutral country for three years. This was because Ilkalita (later baptized Rubina) had been denied to him under tribal law. Albert married wrong way. On his return to the mission he sought employment and worked as a camel boy on the train between Oodnadatta and Alice Springs. In the late 1920s Albert took an interest in the emerging crafts industry at Hermannsburg. He began decorating mulga plaques with scripture and images of native plants and animals. This led to his first commercial success in 1932, when he was commissioned by Police Constable W. Mackinnon to make a dozen oval plaques. Albert became interested in watercolour painting when he saw an art exhibition at Hermannsburg featuring the works of Rex Battarbee and John Gardner. The paintings amazed Albert who immediately sought painting materials and information from Pastor Albrecht. “How much this fella get?” Albert asked. Albrecht first dismissed Albert’-s interest in painting but Albert persistently returned. “I think I can still do it”, Albert said. Albrecht reconsidered Alberts request and consulted with Battarbee who encouraged the idea and offered to teach painting to any Aboriginal who wished to learn. Battarbee left the mission soon after and did not return for two years. During this time Albert toiled with his paints but, after his initial enthusiasm, decided to wait for the lessons he had been promised. In 1936 Battarbee returned and commissioned Albert, as his camel boy, to take him on a painting trip. Albert guided Battarbee through some of the most spectacular country in Central Australia, including Palm Valley, The James Range and Gosses Gorge. Over the next two-months Albert received his first and last lessons. He progressed rapidly and excelled in draftsmanship, perception of colour and study-of-detail. His first major public exhibition was opened in Melbourne on the 5th of December 1938. All 41 works sold within days. This would become the norm in his future exhibitions. Albert’s extraordinary ability worried some critics of the day. Several state galleries refused to collect or acknowledge his work. During the war years Albert became inundated with requests for his paintings. The strong demand came from Australian and American soldiers who were based in the Alice Springs region. A shortage of materials due to the war forced Albert to substitute paper for local beanwood, which he would cut the wood from the beanwood tree and craft it into smooth plaques for painting on. Albert’s reputation grew during 1940s and 1950s. A quietly spoken and well mannered man, he met with dignitaries from around the world, including the Queen of England. People came from afar to meet Albert. Despite all of the hype and publicity, Albert remained modest. Retreating to the peaceful surroundings of his tribal lands, he became internationally renowned as one of Australia’s greatest artists.